Nowhere to go: A view from the MV Akademik Shokalskiy. “Outside, blizzard conditions packing an abnormal amount of ice in to the area for this time of the year, summer in the Antarctic,” ABC News Correspondent Gio Benitez reported on “Good Morning America” Dec. 31. 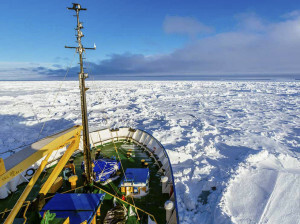 NOTE: RT – Russian Times reported: The Russian ship left New Zealand on Nov. 28 with 74 people on board for a privately-funded research expedition to celebrate the 100th anniversary of an Antarctic journey led by Australian explorer Douglas Mawson. The ship was originally scheduled to return to New Zealand on Jan. 4. 1. Did you hear about the ship stuck in the ice that needed to be rescued by ice-breaker ships (two of which also got stuck in the ice)? 2. a) Did you read/see any report explaining the purpose of the expedition (organized by a climate change professor who was going to analyze how the environment had changed in the Antarctic due to global warming)? b) Do you think the purpose of the mission was newsworthy? Explain your answer. 3. What type of bias did the media display by not reporting on the purpose of the expedition? 4. Do you think this is a case of sloppy journalism or biased reporting? Explain your answer. By not reporting on the purpose of the expedition, the media displayed bias by omission.